Presidents Museveni and Magufuli sign the deal in Dar on Sunday. KAMPALA. 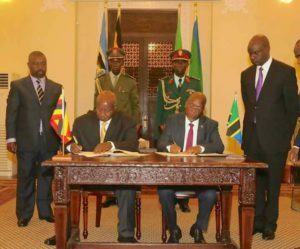 President Museveni and President Magufuli Sunday signed the East African Crude Oil Pipe Line Agreement (EACOP) as an expression of intent to go ahead with the construction of the1400-km oil pipeline from Hoima to Tanga port. The deal in a way ends part of Tanzania’s hesitant approach to integration within the greater East African Community. The bloc’s biggest country and second largest economy has always dragged its feet on integration aspects with silent whispers that Uganda and some partner states have nothing much to offer to the region but benefit from others. The oil deal therefore, would be seen as a valuable package that even Tanzania couldn’t resist. And resist would be a kind of understatement seeing as Kenya was originally primed to deal with Uganda before Tanzania was considered instead. Indeed, Tanzanian President John Pombe Magufuli couldn’t hide his pleasure as he said the two economies should warm up to the prospect of enjoying cheaper fuel once the project is completed. Speaking shortly after the signing at State House, Dar-es-Salaam in Tanzania where they discussed modalities for the implementation of the pipeline and agreed to the terms of the construction, President Museveni said they had agreed that the value added tax to the project is deemed to have been paid. “We have been negotiating on the terms of this project. It is a realisation of the economic and social development of the country. This project will benefit Uganda and Tanzania. It is one of the strategic ways for the integration of the East African Community and will strengthen our relationship,” said Museveni. The President said Uganda has 6.5 billion barrels of petroleum oil that can be used to economically transform the country and was happy that Tanzania had agreed to help out with the project. But the agreement, some observers say, goes against Museveni’s earlier stance that Uganda would construct a refinery within the Albertine oil region for processing the crude oil right from within the country to reap maximum benefit from the exploration. With the Tanzania deal, the oil refinery dream is basically in the ashes until it can rise again like a Kiwi. Museveni himself is not blasé to this fact. “Once we found petroleum oil, my idea was to refine it and sell it in the country but they told me that since consumption is low in Uganda, we need to get a way to transport it to other markets, hence agreeing on the Tanga-Hoima route,” Museveni explained. He noted that the fact that the land system in Tanzania is favourable and Tanga is a protected port from ocean waves makes it justifiable for the oil project as the waves of the ocean do not disturb the transportation. Meanwhile, President Museveni said part of the deal was premised on the need to produce aviation fuel for airlines in the region, saying there was a need for the region to have enough supply of jet fuel once it is refined instead of importing from other countries. “Africa is huge and we need air transport to start using its own jet fuel. Our tourism industry is also big and we need this fuel to transport tourists. Very soon we shall be able to compete with the gulf,” Museveni said.